These are brand-new Gold Rhinestone Napkin Rings. This product shines brilliantly in the light, and is made from our 24 row value rhinestone mesh product. Each napkin holder is 6 rows wide and 5 inches long and secured with hot glue. Note that there are no actual rhinestones on this product. Rather it is made from coated plastic indents that reflect the light very well, giving the appearance of rhinestones. 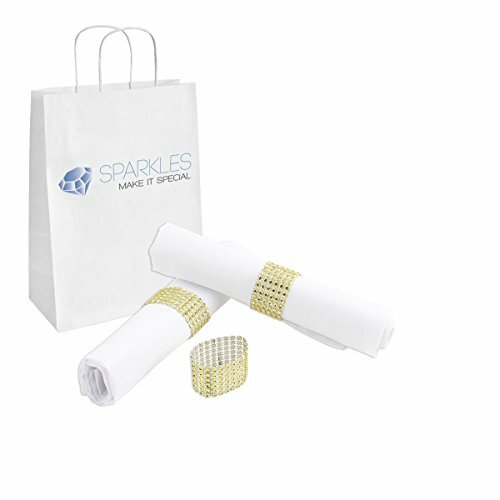 Quantity: 100 Material: Plastic Reflectors Color: Gold Stone Size: No Stones Rows: 6 Length: 5" Width: 1.125"
Jazz up your next dinner party, reception or special event with Sparkles Make It Special napkin rings! Enjoy 100 beautiful Gold rhinestone mesh napkin rings. Each napkin ring is 5 inches long, 1.125 inches wide, and secured with professional-grade hot glue. Simply roll your fabric napkin and slip the napkin ring over it. Rhinestone mesh is an extremely flexible and versatile material that is covered in plastic facets, simulating the look of expensive rhinestones. The napkin rings shine brilliantly in the light. These original and authentic Sparkles Make It Special napkin rings can be used again and again, yet are inexpensive enough to purchase for a single use - bling on a budget! Use Sparkles Make It Special napkin rings for dinner parties, wedding receptions, birthdays, anniversaries, or any special event. Wow your guests with an added touch of sparkle! If you have any questions about this product by Sparkles Make It Special, contact us by completing and submitting the form below. If you are looking for a specif part number, please include it with your message.